(Nanowerk News) Scientists have been exploring new ways to “smell” signs of cancer by analyzing what’s in patients’ breath. 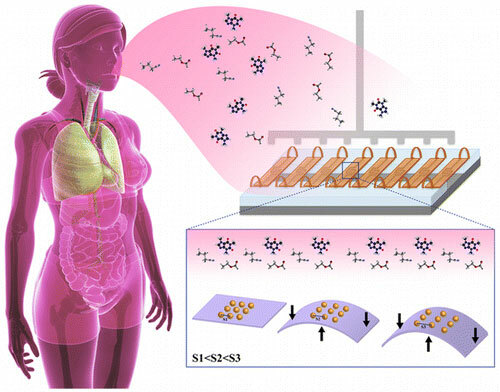 In ACS’ journal Nano Letters ("Dynamic Nanoparticle-Based Flexible Sensors: Diagnosis of Ovarian Carcinoma from Exhaled Breath"), one team now reports new progress toward this goal. The researchers have developed a small array of flexible sensors, which accurately detect compounds in breath samples that are specific to ovarian cancer. Diagnosing cancer today usually involves various imaging techniques, examining tissue samples under a microscope, or testing cells for proteins or genetic material. In search of safer and less invasive ways to tell if someone has cancer, scientists have recently started analyzing breath and defining specific profiles of compounds in breath samples. But translating these exhaled disease fingerprints into a meaningful diagnosis has required a large number of sensors, which makes them impractical for clinical use. Hossam Haick and colleagues sought to address this problem. The researchers developed a small, breath-diagnostic array based on flexible gold-nanoparticle sensors for use in an “electronic nose.” The system — tested on breath samples from 43 volunteers, 17 of whom had ovarian cancer — showed an accuracy rate of 82 percent. The researchers say developing this method further would require larger-scale clinical testing. They add that the approach could also apply to diagnostics for other diseases.